Since the 1980s, the Wilmington Regional Film Commission has had a foothold in the local film industry. 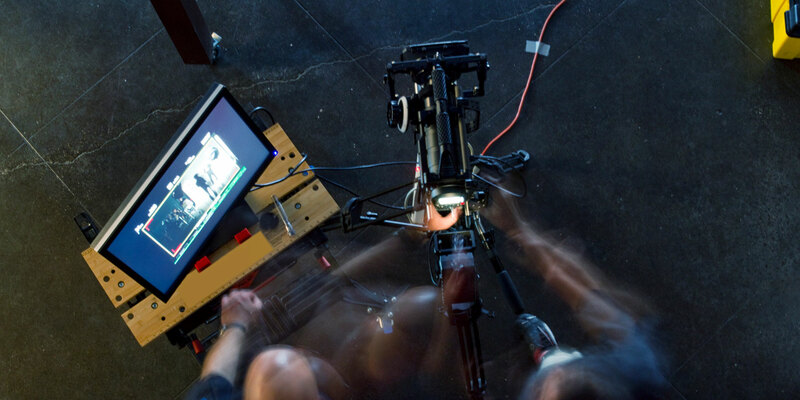 Today, it continues to provide valuable production resources and equipment to incoming professionals. The commission is more than just an informational institution, however. In a state known for its involvement with the silver screen, the Wilmington Regional Film Commission has developed a reputation as the industry’s go-to supplier of film equipment, film space—in its expansive EUE/Screen Gem Studios—and local knowledge that enables filmmakers to capture the most relevant scenery in their productions. 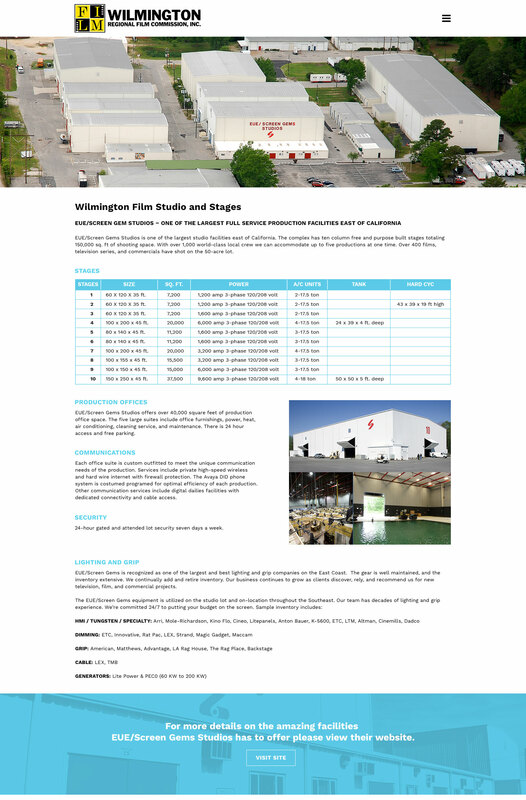 As much a part of the regional community as it is of the greater film industry, the Wilmington Regional Film Commission has the tools, the technical crew, locations, and general experience to guide filmmakers of all calibers through their productions. The only issue was to make sure incoming producers and moviemakers knew that, too. Even through all of the economic changes the state of North Carolina has seen over the last few decades, the Wilmington Regional Film Commission has done its part in ensuring continued quality filming experiences and production. Because of the commission’s persistence and stellar past performances, it’s garnered a reputation for excellence within the film industry and established a reputation for success within the greater Wilmington business community. 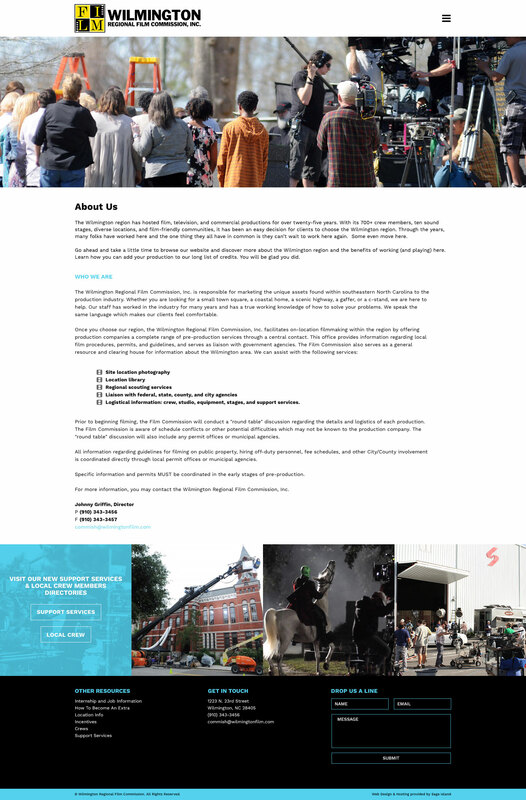 Looking at the Wilmington Regional Film Commission’s existing website and its promotional materials, we immediately noticed that the overall purpose and core of its identity were lost amidst the plethora of details provided regarding the Wilmington area. The challenge was clear. The question became, how do we restore the commission’s identity without omitting any vital industry information required for future film productions? Our attention then turned to developing an organized solution to recapture its purpose and retarget the commission’s main audience. Having been in Wilmington for several decades, the commission had a lot of loyal followers both in and outside of the film scene. But to attract more industry players, the website needed to showcase the Wilmington Regional Film Commission’s special skills and contributions to burgeoning productions. To highlight these attributes, we first focused on refining and restructuring the site’s content. After thoroughly reviewing the content presented across the site, we identified which pages needed trimming and which needed elaboration. We then began refining each page, carefully weaving together new copy with existing information to effectively revamp the commission’s current content. The results? A tailored explanation of what film services and resources the commission brings to the table, including the renowned EUE/Screen Gems Studios facilities. Upon establishing a clearer site map, structure, and refined content, we were able to incorporate a fresh take on the pre-existing branding throughout the site redesign. With the assistance of our client, local media outlets, and various contributing production companies, we collected and introduced a variety of new photography on the site showcasing both the commission’s past and present successes and featured contributions to the film industry. Along with photography, we expanded on the client’s existing brand color scheme, introducing a new blue hue to help counterbalance the intense, yet playful yellow and black “FILM” logo mark. The color addition also helped highlight the commission’s technical benefits such as providing equipment and resources for producers and filmmakers alike. All of this was done to bring out the positives of working with the Wilmington Regional Film Commission as the area’s premier film production hub. 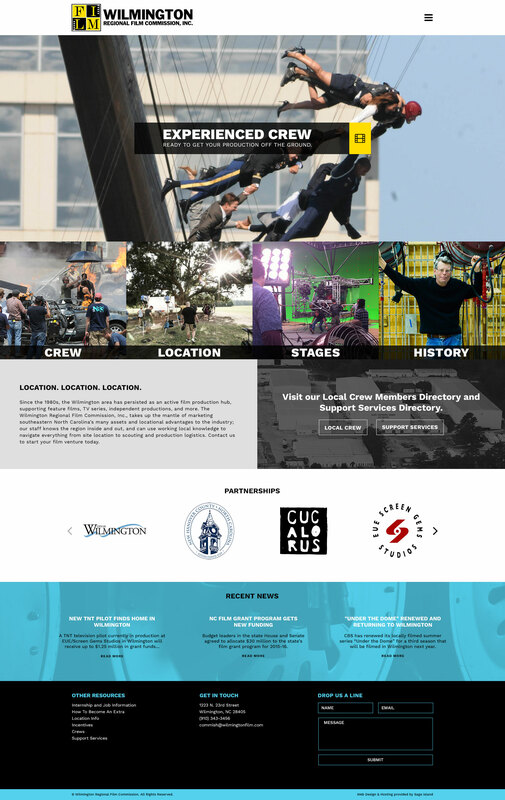 By optimizing the Wilmington Regional Film Commission’s copy, we managed to condense much of the content, ultimately aiding us in restructuring the site’s navigation. With concise copy and fewer points of entry, we created an organized flow of user information, making the site easier to navigate and use. The final design is developed around a responsive framework, making it functional on all devices. This makes simple features like searching for the perfect film location or connecting with on-site film crews more intuitive for the modern film industry user. To promote its community presence and industry expertise, Wilmington Regional Film Commission also asked our team to design an innovative print collateral brochure. 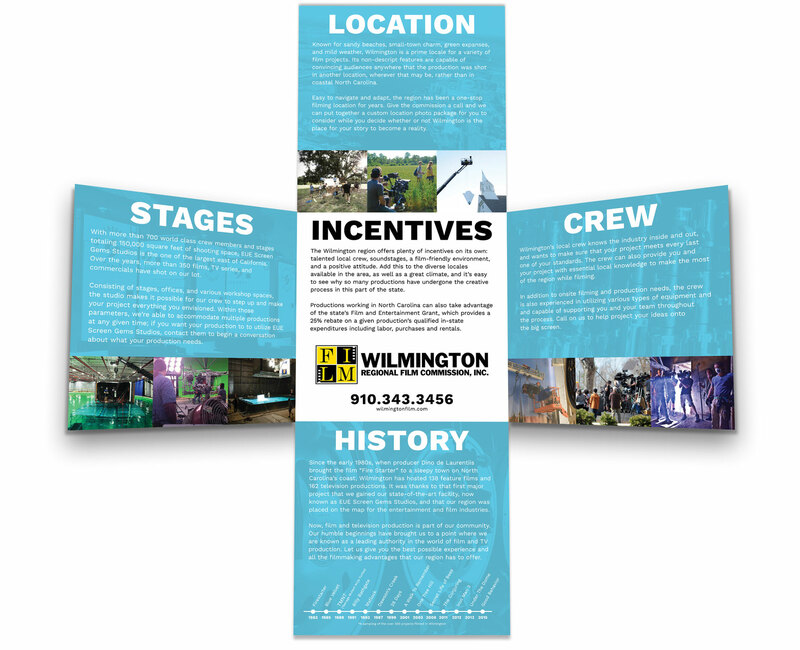 Before beginning the design process, we first developed copy highlighting the commission’s five key areas of involvement in Wilmington’s bustling film industry, including its history, crew, stages, location and incentives. We then experimented with multiple print layouts, ultimately deciding upon an “iron cross” five-panel square design. With its cross-hatch layout and styled folds, this print piece creates a unique and memorable leave-behind that advocates the commission, its presence, and its influence in production within the Wilmington area. 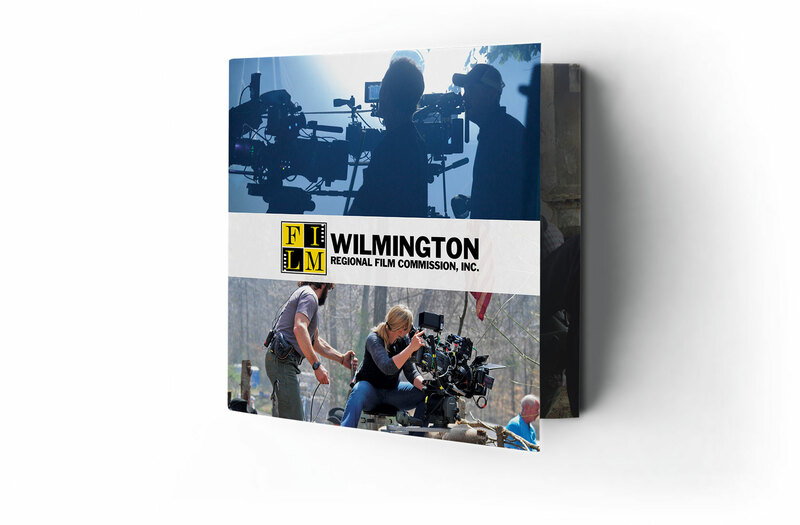 We were pleased to launch the Wilmington Regional Film Commission’s new website and present them with cohesively branded print brochures to further encourage regional economic and artistic growth within the film production industry. Our team continues to monitor the results, but we expect that our cohesive branding and goal-oriented deliverables will translate into more business for Wilmington Regional Film Commission. To get started on reenergizing your business or campaign, contact us today.